We deal so much with the digestive system we often need a reminder to understand just how it does work so well. It also reminds us that what we put into our diet really does matter even if the system can deal with it. Been circumspect regarding concentrated foods is natural wisdom. We know it is too easy to over indulge. The twenty four hour cycle is worth knowing although it is also worth understanding that the heavy lifting is done in the stomach inside two and a half hours and I suspect the dwell time in the small intestine likely lasts several hours at most. The large intestine serves to recapture water and concentrate the final waste. This takes most of the time. (NaturalNews) Health begins in the gut has been a central theme of Traditional Chinese Medicine (TCM) and Ayurvedic health principles. This includes the complete digestive system, with special emphasis on the spleen and liver in both ancient traditions. The whole cycle of digestion and nutrient absorption, from chewing to bowel elimination, should take 24 hours more or less depending on what's been eaten. More time indicates a sluggish metabolism with foods, especially meats, putrefying in the gut and/or constipation; while less time indicates not enough nutrients are being absorbed. A simple test with beets can reveal how long your digestive cycle is. Eliminating beets' creates a red stool. Eat beets and see how long it takes for you to produce a red stool. Of course, there are other phases and contributing organs involved with digestion. As you become aware of the food visually or by smell, the brain signals glands to begin secreting juices into saliva. The saliva and juices are intensified as you chew, and the saliva contains enzymes that begin working on removing nutrients from the food. This is why many recommend chewing slowly and more often than usual. As the saliva moistened food slides down the throat, it comes to a fork in the road. One fork is the trachea, which connects to the bronchial and lung area. The other is the esophagus leading into the stomach. The act of swallowing closes a flap over the trachea and opens the upper esophageal sphincter allowing the food to bypass the airway and enter the esophagus to the stomach. The esophagus undergoes contractions to push food down to the lower esophageal sphincter, which opens to let the food into the stomach and shuts to prevent stomach acids from coming up that creates acid reflux (heartburn). The stomach secrets acid enzymes while mucous protects the inner walls. The walls churn to mix the acid and food, creating a liquid or pasty solution, depending on the food type, which the small intestine can handle. The small intestine is small in circumference only. It's estimated that the surface area of the small intestine could cover a tennis court. It fits in the body because there are many folds containing villi. Villi are tiny projections containing smaller micro-villi that pull nutrients into our blood streams with the help of liver and spleen activity. The liver and gall bladder contribute fat emulsifying bile into the small intestines and the spleen contributes more enzymes to support the absence of food enzymes. Enzymes are active proteins that break down food into absorbable nutrients. 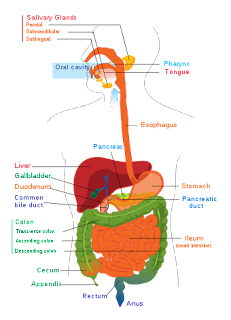 The first part of the small intestine, the duodenum, receives the enzyme and bile mixture. Intestinal contractions ensure this mix is exposed to the various villi to absorb the nutrients. The remaining mixture arrives into the large intestine, which is shorter with more circumference. The large intestine has three phases for creating waste, which arrives into the colon where a bacteria colony awaits to finalize fermentation and fiber extraction. Mucous is created within this process to help slide the stuff along, then the waste is ready for eliminating with a bowel movement. Avoid pasteurized foods and beverages that destroy enzymes. Eat raw veggies and fruits or juice often to take in more digestive enzymes. Add full spectrum enzyme supplements to your diet.